Do you ever feel lost in your life and not sure what you want to do? You might be having problems with “self-actualization.” Self-actualization is a psychological concept that describes a position of being fulfilled with your job, relationship, or life in general, and that you are meeting the goals you set for yourself. One of the biggest components of happiness is reaching a state of self-actualization. However, reaching self-actualization can be challenging for those who don’t know where to start. 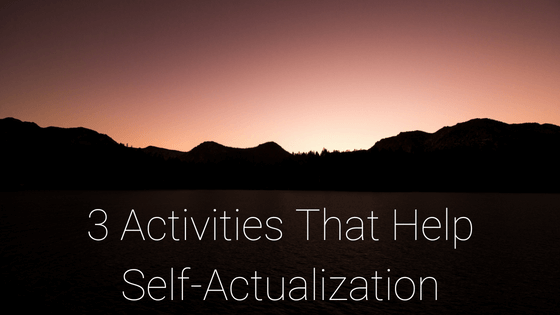 If you’re feeling lost, try out these three tips for achieving self-actualization. Think about your motivations behind both the things you do and your goals. Start out by thinking of a goal you have, like “buying a Corvette.” Then ask yourself “why” you want that goal. You want to buy a Corvette. Why? Because you think having one would be better than your junker car. Why? Because I want people to have a positive opinion of my car. Why? Because how others view me is important to my self-image. By continuously asking yourself why you want to accomplish your goals, you might understand more about your motivations and what drives you. Once you know what your motivations are and what you value, you can prioritize that to become happier and more fulfilled. Ask yourself ‘what kind of person do I look up to?’ Think about people you admire from both the celebrity world and your own life. Do you like the rappers with a dozen pounds of gold chains singing about their wealth and success? Or do you admire your coworker, an honest family man who works long days year after year to provide for those he loves? Or do you admire politicians who work to make the world a better place? Write down what traits you admire about your role models and see what they all have in common. These traits will be things you value in yourself and others and are traits you should work to grow or maintain. Nothing gets your more introspective than picturing your inevitable death. Imagine you’re dead after living your ideal life and someone is writing about your life and what you accomplished. What would you want them to say? Would you want them to talk about your charity? Your work or career? Your relationships with those around you? Writing out your obituary will give you an idea of what is most important to you in life. Once you’ve reflected on your obituary, you can be free to live the life you wrote about.